Agent School is a 12-step interactive training and resources program that will motivate you to propel your Real Estate business to new heights. A 12-week video based training program that will transform the way you do business and motivate you to build the momentum you need for success. Exclusive only to Agent School members. 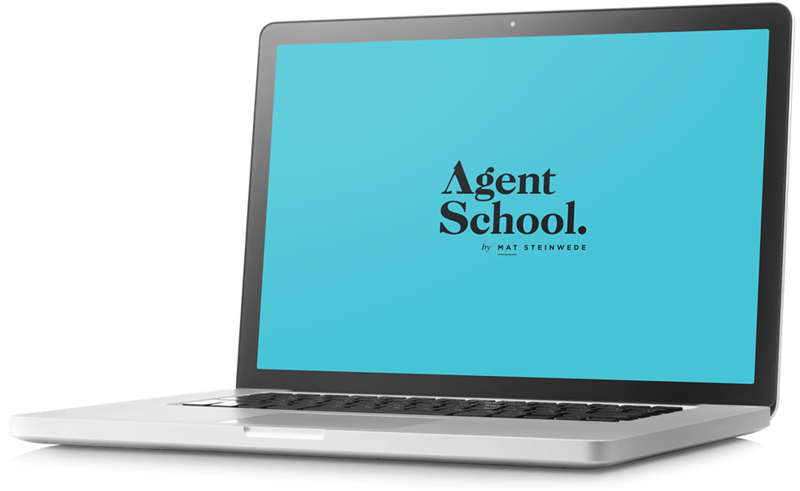 A new subscription-based feature that you ADD ON to your Agent School Membership. Features include exclusive content from Mat, inspiring webinars and personalised responses to specific ‘Ask Mat’ questions. Mentoring with Mat now available. A single four hour face-to-face personalised session for up to 15 agents. We’ll teach you to shift the way you think and program a Mindset Of Success. You’ll learn how simple daily steps can help you create a solid foundation in your core area and how you can build towards success on top of that foundation. We’ll cover prospecting, nurturing your buyers and how to approach listings and auctions. You’ll also find out why becoming a corporate athlete is one of the keys to a productive work-life balance. We’ll reveal our tips for building an efficient database and help you polish your business and marketing skills so you can achieve your dream for your business. Set a solid foundation for your long term success. Successful people know how to shift their mindset and focus on achieving more. The first module will help you make that key decision, change your thinking and create the energy you need to achieve your goals. High-performing agents all have a system that allows them to build results, layer upon layer over time. Mat’s system focuses on setting up a core area in a way that allows you to lay the solid foundation that’s fundamental to a consistently successful real estate business. It’s often said that prospecting is the number one activity that can help drive your business forward – but how do you go about it? Mat takes you through all the prospecting steps he puts together that help set his business up for future success. Effectively managing buyers is obviously a key part of your role in selling real estate. Find out how Mat focuses his attention to allow him to take better care of some people and nurture others through the buying process. Being a high performer in real estate means being a great listener. Learn, step-by-step what Mat does to secure more than 100 listings every year. The Power of a Timeframe. Learn how to refine your auction listing process and understand Mat’s proven steps. From taking the first photos of the property, to selling on auction day. Or even not selling and still achieving a positive outcome for your seller and yourself. Pave the Way to Your Future Success One Person at a Time. Mat shares his experience and ideas on databasing. You’ll learn what groups he uses within what databases, and how he manages them to get the most out of them. All while keeping things as simple as possible. This is where you can really create a difference in your performance. Understand how to build awareness about you and separate your brand from your company’s brand to help consolidate your personal success. The better your body and mind are, the better you’ll perform at work. Taking simple daily steps towards thinking and behaving like a corporate athlete will help you operate at the highest level you can, every day. One of the most powerful systems you can use to create success in life and improve your performance. Mat shows you how to create a system that works for you and your business. How does Mat structure his team and what do they do every day? Learn how Mat runs his top-performing business unit and understand the steps he took to get there. Success in real estate is years in the making. How do you use what you’ve learned to generate the momentum you need to keep kicking your business into ever higher gears? What does Success in Real Estate mean to You? Writing larger figures? Improving your work-life balance? Re-learning to love what you do? Whether you’re a Young Gun or an Old Dog, my proven formula will help you restructure your career to achieve your own personal vision of success. Step by step, I’ll take you through the system I’ve developed over 20 years of selling real estate, and teach you how to develop the skills and the focus you need to get to the top. Ready to create and commit to your Dream Real Estate Career? We’ll give you tools, strategies, and a proven roadmap to make it happen. A year from now, you’ll be thrilled you started today. If there’s one thing I’ve learnt about real estate, it’s that having a solid system is something all the top agents have in common. I’m here to share my system with you: all the proven insights and tips I’ve learnt over 20 years in the business. But a successful business is only half the story. I believe that with the right focus, we can all achieve our dreams and enjoy life at the same time. As a dad of six, I know how to fit success at work around a rewarding, but busy, life. In Agent School, I’ll share those insights and habits with you.